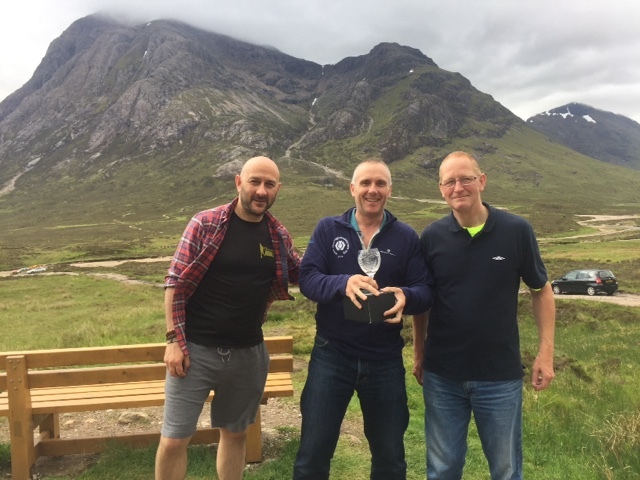 Darren Barnes - Endurance, Adventure & Ultra Marathon Running Blog: "My EPIC journey into unknown territory"
So here we meet again, as I embark on a journey that requires great endurance. A journey that also requires self discipline, the ability to maintain focus and deliver mental strength as Travis Macy author and endurance athlete quotes "having the ULTRA mindset". 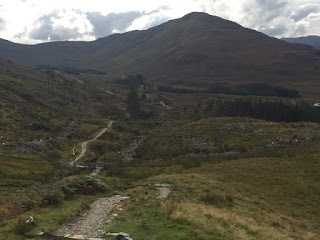 "A Journey into unknown territory, as I endure the famous 95 mile West Highland Way race"
With countless hours of dedicated training that required self discipline, focus and hard effort that would propel me through my "Periodization" cycle. You may ask yourself what is a Periodization cycle ?. These cycles are the build up to your objective race. Each Macrocycle can vary in length between 12 to 16 weeks all pending on the race plan. They consists of a series mesmocycles, which are a group of activities that include separate sessions of (base miles, strengthen training, tempo or hill work). These are the core principles and foundations that I used to constructed my race plan and strategy in preparation for the West Highland Way race. 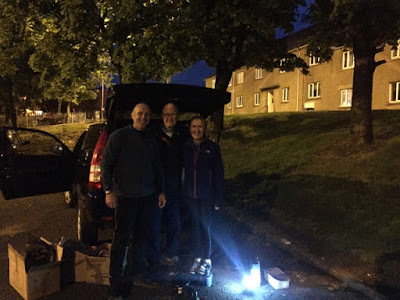 It was Friday 20th June as I checked over the equipment, nutrition and hydration that my support crew would need to assist me with during the race. I was delighted when Ray and Sarah took up my offer to join me in the race as my valued support crew. 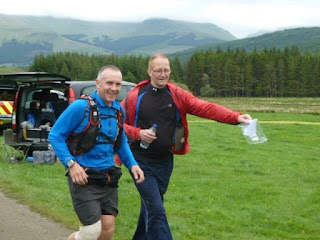 Their experience of competing in races of over 110 miles and working well together in a team was second to none. In advance of the race, I had carefully scripted out a race plan and strategy. However, after countless revisions. I decided to settle on version (6), which I issued out for them to familiarise themselves with my requirements. I must commend them on being very tolerable with my perfectionist approach to the overall race plan. Leading up to registration, my crew carefully prepared my pre race meal of porridge with jam, wholemeal bagel with almond butter, water with chia seeds and a banana. 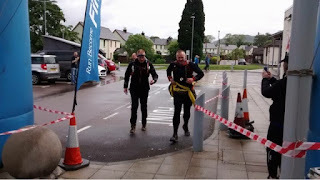 The below link takes you to the start of last years race, which I also competed in. Just as the horn was sounded to confirm the start of the race, the heavens opened and it started to rain. I thought to myself, drat here we go again for 3rd time. As I approached Conic Hill at 3:30am at 16 miles . 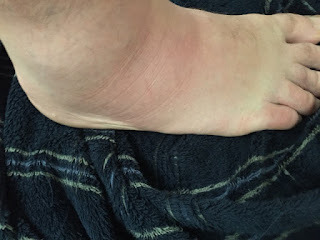 Without warning I developed a sudden sharp pain in the side of my right foot and lower calf. As you can imagine, I was starting to think to myself why was this happening to me. If I do not take swift action and attend to the matter quickly, then this could be the end of my race. Foolishly, I decided to take a chance and carry on running until I reached CP1 (Balmaha) at 18.5 miles. • Take off rucksack and replenish with snacks and hydration. • Drink 500ml of water. • Address any skin or clothing issues. • Put back on rucksack and adjust for comfort. • Spray on Mozzie spray & Suntan lotion. • Leave CP and walk while eating food accompanied by either Sarah or Ray to collate & dispose of waste in to the nearest bin. • Crew to keep me informed on my run time and cut off times. After 5 minutes of R&R, I was off running while still eating my porridge. Have you ever tried eating porridge and drinking tea from a mug at the same time ?. Ho and not forgetting the biting mozzies!. However, as I always tell myself "it's all character building". 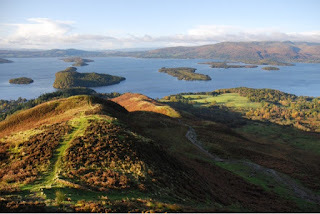 As I approached the shores of Loch Lomand, I started to suffer pain from a grumbling IT band. Drat I thought to myself what's bloody next !. Its a rarity that I suffer from these type of muscular issues, as my upper and lower body core is solid and robust. Upon arrival at CP1, I decided to change my trainers for my comfy HOKA Stinsons. But to my surprise, the toe boxes had stretched and were far to big for my feet. It was time to introduce plan (C), my 2nd pair of Sketcher- Go Ultra trainers. I had learned a valuable lesson form this and that is to "never leave your wet and dirty trainers to dry out or they will deteriorate quickly". Further on into the race, I was starting to feel energised all thanks to eating dried dates. However, the issues with my IT band was still present and it felt like someone was pulling at them with a pair of pliers. 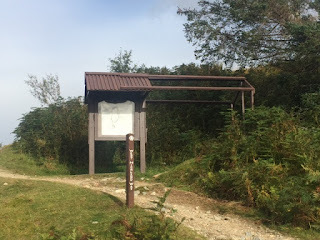 Upon reaching CP5 (Auchtertyre) 50 miles, I was ushered to the weigh station and to my surprise, I actually gained body weight. Could this be down to consuming to much fluids ? or, was it due to me wearing heavier mid layers?. I shall never know. My mind was fixated on reaching my next objective, which was to reach CP7 (Glencoe Ski Centre) 70 miles before the 12am cut off time. As we (Ray) and I approached Ranoch Moore, our spirits were high and our bodies in great shape. Although the under footing was hard going with protruding rocks and sharp stones. Our running economy was undulating "moving with a smooth wave - like motion",which I put down to practising endlessly (basic skill sets) during my weekly base training sessions. We arrived at CP 7 (Glencoe Ski Centre) just after 10:30pm, which ment that I was 120 minutes ahead of last years race time. 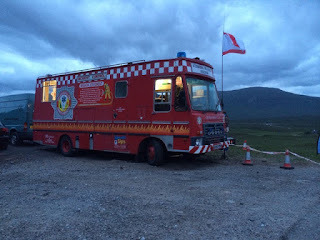 After a quick 5 minutes R&R, we were back up running on the WHW (West Highland Way) race. 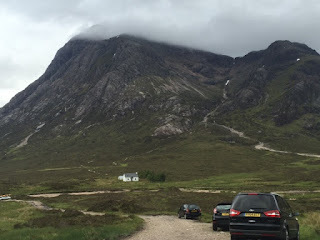 Upon starting the ascent of the Devils Staircase in (Glencoe) at 74 miles, I had to stop and attend to an aggravating blister. 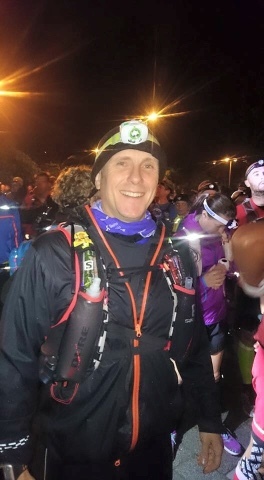 It was just after midnight and I had been running for over 23 hours and we still had another 21 gruelling miles to go before the end of the race, "Rome wasn't build in a day"!. During the ascent the weather had started to turn for the worst, bringing with it wind & driving rain. In fact the rain was hitting us hard at 90* degree angles. During this very tough time, I played over and over in my mind a song that would help me overcome these difficult times. 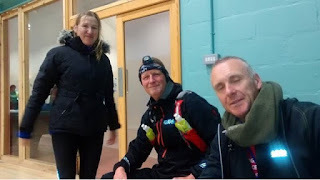 We reached CP8 (Kinlochleven) 80 miles in to the race just after 4am. After a brief consultation with the race doctor, who managed to address my achilles tendon problem by packing out the rear of my trainer with felt. I was quickly back out on to the final stage in the race. The weather was atrocious with high winds and driving rain, but we still had high spirits. After passing through Lundavra at 90 miles into the race. Suddenly and without warning my body stopped moving forward. I had bonked !. This was the only time during the whole race, that I had experienced this sudden sensation to stop moving. What is happening to me I thought to myself ? "Bonking or hitting the wall means sudden fatigue and loss of energy, which is caused by the depletion of glycogen stores in the liver and muscle". My mind had started to play tricks and my muscular system was starting to fail me, which I endured for over 60 minutes. I tried to consume as many carbohydrates as possible without throwing it all back up. I digested endless amounts of Jelly Babies and dried dates. During the final stage of the race, I had experience hugh swellings around both my calfs and feet. The structure of my running shoes were stretched so wide to protect my swollen feet. 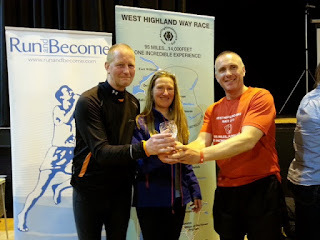 I eventually cmpleted the West Higland Way race after 34 hours and 11 minutes of running. 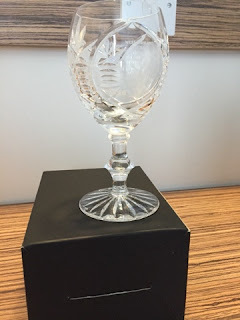 Soon after I crossed the finishing line, I was presented with my WHW finishers Goblet. The day ended with a curry and several beers shared with my wonderful race team. The West Highland Way race is a fantastic event & challenge. I struggle to compare any other race to this incredible experience. The race is extremely well organised & supprted by race marshals & volunteers. As Arnold Schwarzenegger says "I'll be back " for a PB ! Facebook "TEAM WLAC (We Love A Challenge)"